Disclaimer: I did not make this tool, but I am uploading it for posterity since I cannot find any active download links to it and it really is quite useful. 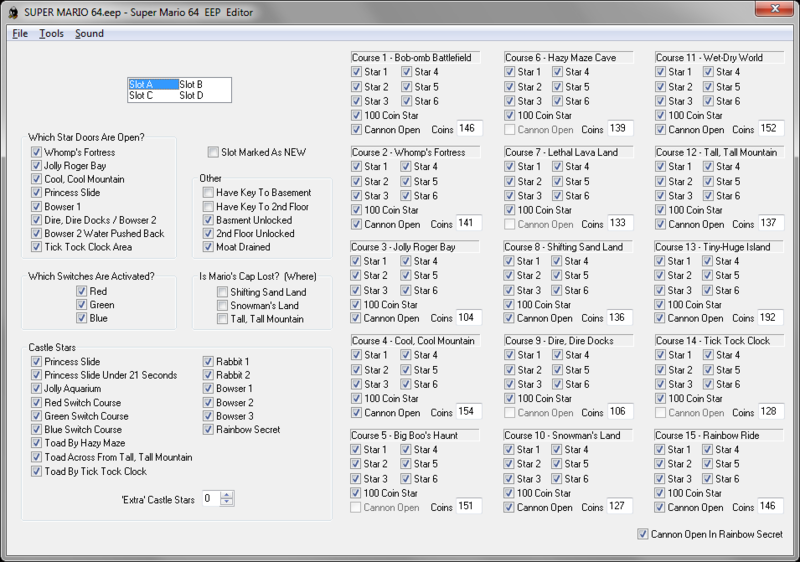 I stumbled on this "SM64 EEP Editor" tool from a SM64 hacking tools collection. I saw some forum posts over on emutalk.net from 2005 regarding it, but no download link. The author hasn't been active since 2006 and his last post in the thread was unfortunately "anyway, the source code for the SM64 [EEP] Editor has gone down a green pipe, forever lost"
This lightweight tool allows editing of SM64 EEPROM files, including stars collected, level coin counts, keys/doors unlocked, cannons opened, audio settings. The EEPROM is a storage chip embedded in the cartridge and is emulators store it as a ".eep" or ".sav" file on your disk. This program looks like it was well put together, props to whoever had originally threw it together. Sad that the source was lost. I'll see if I can get any use out of this tool. Thanks for the upload! (14-10-2016, 07:06 AM)queueRAM Wrote: anyway, the source code for the SM64 [EEP] Editor has gone down a green pipe, forever lost"
For the sake of lulz I created a small console based open source remake of this tool in C called sm64eep. No clean code. No guarantees. Make sure to back up your save game prior to using this tool.